2. Used as everyday home decor, great for mantel, picture window, baby room or as photot props. 4.Perfect present for your little princess or prince as Christmas Birthday gift. 1. LED bulb produces no heat after long-time use,you can touch it after long time use. 4.No power outlet needed. It requires 2 X AA batteries (not included) with the on/off switch on the back. 5.Designed mainly for decorative purpose. Cannot be taken as a substitute of daily lighting. 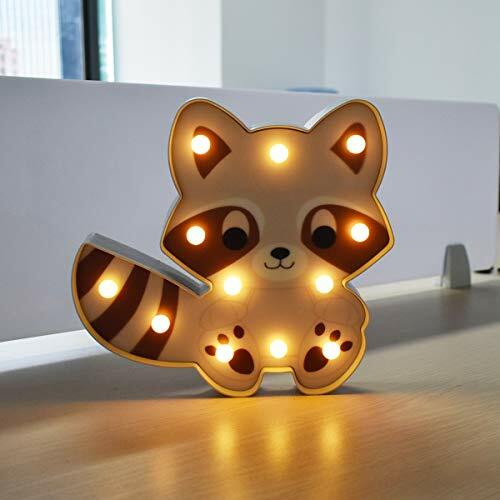 Package included: Raccoon LED light with 10 LEDs,bring a cozy and fabulous glow LED light into your home. ABS & PP Material., sturdy but not too heavy. Safe & Versatile. Charming child's LED battery operated animal night light. Makes a perfect and fun addition for baby's nursery or child's room. If you have any questions about this product by Worpee, contact us by completing and submitting the form below. If you are looking for a specif part number, please include it with your message.